I love Japanese rice bowl dishes, they are relatively easy to cook, easy to serve and easy to consume. An all in one dish in one bowl, this is how a fast food meal should be like so simple yet so delicious. If you have noticed almost 70% of the dishes I post here involve rice directly or indirectly (dishes) meant to be paired with rice but until now I haven’t discussed something about it. Well here is my chance now. Rice for those who does not know is the most important staple food for a big percentage of earth’s human population; it is staple for most of the countries in Asia and South America. Next to corn this is the grain that tops the charts in production. Rice cultivation is prominent on countries with low labour costs and high rainfall that is why most of the rice is produced in China, India, Indonesia, Thailand and the Philippines. Rice has many varieties from long to medium and short grains. The difference between is the texture. Long grain rice tends to remains its shape after cooking most commonly used as an accompaniment to different dishes, medium grain rice tends to be more sticky and widely used in sweet dishes, risotto and sushi, while short grain rice are used primarily in rice puddings. Rice believed to have started in the Yangtze river in China around 11000 years ago as scientists saw large number of wild rice phytoliths at the Diaotonghuan archaeological site dates to that time. Fossils indicate that rice collection was part of the early settler’s means of subsistence. There is also evidence that rice characteristics had changed after 2000 more years which indicated that was the time it started to get domesticated. Then new varieties were grown in Central China in between 3100-2100 BC then it spread rapidly into Southeast Asia and India. The Moors then brought rice to the Iberian Peninsula in the 10th century while the Muslims brought rice to Sicily. Then many years later the Spanish colonizers introduced rice to Mexico and it happened during the 1520’s and the Portuguese to Brazil. Now many years later this staple is easily available anywhere with different sorts of varieties. In our household we make sure we have 2 to 3 varieties always and those are jasmine rice for everyday cooking (we usually but this in 25 lbs. ), glutinous rice for rice cakes and sometimes sushi rice. How about you what type of rice do you have in your pantry? What is your favourite variant? In a hot wok add oil then sauté garlic, add chicken and cook until browned on all sides. Pour chicken stock, light soy sauce and mirin, bring to a boil then simmer for 10 minutes. Add spring onions give it a good mix then pour the eggs do not stir at this point, put heat on low and simmer for 2 minutes. Turn heat off, place freshly cooked rice on a bowl then top it with the chicken mixture. Serve immediately. rice toppings………..simple nga tito mon pero masarap!!! !… penge po!! We just recently discovered Japanese rice bowls. I love them! This one looks like another variation I would enjoy. A big bowl of goodness! For sure this be great for me as preparing one complete meal is such much time saving and you have added what I adore the most, rice!!! I think Japanese rice is considered short grain rice. Compared to other Asian rice, it’s so expensive but rice is definitely not a side dish to us, and we consider it as “main” dish and we really take it seriously. Rice in Japan is shining and little sweet and ohh so delicious! We even have saying that “we are happy just with rice and pickles.” California grown Japanese rice is not as bad, but definitely missing something. I love your donburi Raymund. It’s always my go to dish when I’m busy – one bowl with rice, veggie, and meat. Easy to clean! Wow, I really like this Chicken Scallion Rice Bowl. I’ve never made anything like it before and I love scallions in a dish. Give me a second helping of this dish! Even though I haven’t taste it yet, I assume that its Yummy, coz its japanese style. I like most of things about Japanese. Very interesting facts about rice! I have lots of different kinds of rice in my cupboard, but I probably use brown rice the most. 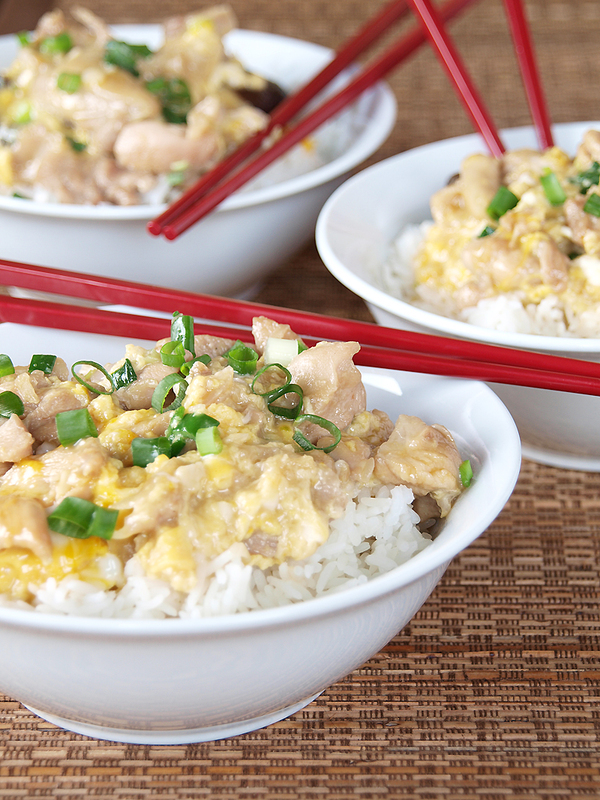 This rice bowl looks delicious- a meal in a bowl! i didn’t know before that rice comes in different types: long, medium and short.. is glutinous rice the same as sticky race? One bowl dishes are awesome. This looks fantastic! SO glad to read your explanation on rice types! How helpful!